I'm coming to the conclusion that a significant portion of our current prison population should be cared for in much less expensive environments that offer the promise of much more positive outcomes. I have a number of reasons for saying this--the experience of a number of states who seem committed to changing the system for non-violent offenders, the amazing strength of the "prison lobby" in this country, the terrible recidivism rates for ex-incarcerated persons, and personal experience with inmates and former inmates. Blonde Justice has an interesting post discussing why a rational criminal defendant might choose short-term incarceration in the county jail rather than a probation sentence. It made me think of the Grits commenter who, reacting to this item, cited probation officers suggesting that potential probationers routinely making such choices in Harris County contributed to jail overcrowding. I've heard similar comments before, that a large number of misdemeanants in Houston (I'm sure it's true for a certain percentage everywhere) would rather sit out their time in jail than report to a probation officer and meet various court imposed requirements. I've never seen statistical documentation showing that such defendant decisions account for a signficant portion of Harris County jail overcrowding. But if that's true it means the probation system is broken and not fulfilling its function, that the requirements are simply too onerous for average people to complete them. Another instance of programs failing not because they're not well intended, but because they're not well designed. Via Doc Berman. "A great designer has to know everything (language, history, ethnography, anthropology, psychology, biology, anatomy, etc. ), while an artist doesn't have to know anything. This polarity ... is the starting point. But ironically, to really appreciate design, it is not about knowledge, but about the experience of living with the work; you don't have to know anything, and you get its 'information' almost through osmosis. Whereas to appreciate a good artwork, you have to bring and apply absolutely everything you know. Why is that? Why indeed? It strikes me that good governance is a lot like good furniture design - the best government is that which we comfortably live with because of its ease and utility, the government that people don't notice but rely upon. When government becomes intrusive, uncomfortable and ugly, when it causes problems instead of creates solutions, when it becomes a frequent topic of conversation for average people instead of one of the silent underpinnings of everyday life, it's more frequently because of klunky, ill-fitted design than overtly ill intent. That's why evil can so often appear "banal" - it's frequently disguised as gracelessness. I'm not completely sure how the quotes connect, but Tuttle's statement has always reminded me of a famed comment by the great Texas Congressman Sam Rayburn, who served as speaker of both the Texas and US House: "Any fool can tear down a house," Rayburn declared, "but it takes a carpenter to build one." An artist doesn't have to know anything ... but a designer has to know everything. "I am concerned both by recent immigration raids conducted by Sheriff Leo Samaniego in El Paso County and by confirmed reports that the sheriff is setting up roadblocks and asking vehicle occupants for driver's licenses, car insurance information and social security cards," Senator Juan Hinojosa wrote in a letter to Perry last week. " These raids and roadblocks are questionable in legality, and may give rise to civil rights lawsuits against Texas …I am asking you to develop a policy regarding the use of funds received under your border initiative -- Operation Linebacker." No word on whether the Governor will create such a new policy. He needs to. Sounds like he's passing the buck on the civil rights complaint. What are you reading? Or, what do you plan to read on vacation this summer? The ACLU's litigation against a now-defunct drug task force in Hearne, Texas will be featured in a July 15 episode of Court TV's The ACLU Freedom Files. If you're on a computer with speakers, a preview is here. (Long-time readers will recall Grits at one point was quoted by the defendants, i.e., lawyers representing the drug task force in that case, in one of their briefs, but the federal judge ruled with ACLU on all those points.) The case was ultimately settled out of court. Watch the July 15 episode on Court TV. I'll post a reminder closer to it and a link to the webcast when it's up. Thanks to Anjuli for mentioning it. Though Harris County Sheriff Tommy Thomas told the media the problem was resolved, Chief Deputy Mike Smith told the Texas Commission on Jail Standards at their May 4 meeting that "currently the average number of inmates without bunks is between 350 and 500 at any given time," according to the minutes (pdf) posted last week on their website. After Deputy Smith's presentation, the Commission voted to require the Harris Jail to transfer or otherwise find alternative accomodations for 500 prisoners, but Sheriff Thomas appealed the ruling, buying himself a 90 day window. Harris county commissioners and judges will have to assist the sheriff to make any progress, probably in the face of a defiant District Attorney, so I'll bet there's a lot of behind the scenes politicking going on right now about sentencing practices and the jail, especially for low-level drug users. The situation will be helped a little by a new 300-bed drug treatment center openting up. Presently according to the Houston Chronicle, 170 men and 38 women are waiting in the Harris County jail for treatment beds to open up. (See Dale Lezon's article: "300-bed downtown facility is expected to ease pressure on the jail, speed help to the addicted," May 28.) But judges and the county commissioners court still need to get to work to find more effective solutions. Even if they achieve short-term compliance, that in no way implies they've found a long-term fix. RELATED: See "What they're reading at the Harris County probation department," and "Grits' best practices to reduce county jail overcrowding." "They're locking them up almost two years on the average. It's costing you $56,600 per year (per child), and 55 percent of them are back within a year," Southwest Key President Juan Sanchez said. More than 60 percent of juvenile offenders in Travis County completed Southwest Key program in 2004. Depending on the child's needs the program can cost from $11,000 to $44,000. However, 48 percent of the juveniles who completed the program were re-referred or arrested as adults. Another TYC cost is emotional turmoil. Kids here must face possible crime within the secure environment. Gangs do form and troublemakers cool their heels in a special lock-up. "Temptation is easy in here for doing the wrong thing, like stealing and fights. It's hard. You've got to pretty much use your self-control skills and coping skills," TYC inmate Steven Howard said. But there are those who resist the pressure and use their time in lock-up for positive change. Maybe I've been involved in these local feuds for too long, but I yawned my way through KLRU's Austin Now program last night documenting the cold war between police administrators and the Austin Police Association. The issue, as it's been for my entire adult life in this town, is whether, when and how to discipline officers for excessive force and misconduct. The union says no, never discipline - officers deserve complete discretion, even or perhaps especially when someone dies. The chief says, well, maybe they should be disciplined, sometimes, when misconduct becomes public and highly politicized. The public says, "Yes, discipline them every time they engage in misconduct, even when it hasn't become public - that way we won't have to make it political in the first place. That's the whole debate, and it's nearly the same players who were making the same arguments 5-6 years ago when Austin's police oversight system was created. Former APD offiicer Carla Nickerson (she's now on Austin's oversight board) and civil rights attorney Jim Harrington did a good job articulating criticisms of the department. But the show wasn't very solutions-oriented. Police chief Stan Knee, who just resigned to go train cops in Afghanistan, came off as a man between a rock and a hard place. Police union lobbyist Mike Sheffield stridently declared any decision was justified when made in a "split second." City Manager Toby Futrell came off as defensive and just a little whacko. (Blink, sister!) If you just can't get your fill of petty squabbling and sometimes disingenuous posturing by insiders, cops, and various city bureaucrats, here's KLRU's page on the story and if you've got high-speed access, the full video feed. I wish producers spent a little more time fact checking their interviewees' comments before airing, or gave voice to a more varied group instead of the same, tired insiders. (I thought the piece they did in 2004 was a little sharper.) Futrell in particular offered some oddly skewed statistics and comparisons to much bigger cities to make her case that Austin really didn't have a big problem. From the opening lines she framed the debate in a particularly ridiculous way. But she ignores the point: We've witnessed undeniable management failures when there HAVE been problems, plus Austin's so-called civilian oversight systems (our police monitor and review panel) are toothless, opaque, distrusted by the community, and ignored when they make recommendations. Even when the chief finds that misconduct occurred, it's become difficult bordering on impossible to fire officers for misconduct under the current system - in the 70 or so Texas municipalities that have opted into the state civil service code, an arbitrator jointly chosen between the union and the city gets to decide, not the police chief. See a report in the Austin Statesman today on one of the most contentious, politicized arbitration hearings in recent memory - Julie Schroeder, whose termination after killing an unarmed youth named Daniel Rocha was featured in the show. The union is fighting to have her reinstated. This kind of publicity is rare - frequently arbitrators overturn the chief's decision with little fanfare. Arbitrators who want to the unions to agree to hire them again in the future don't choose to fire many officers. Worse, the City has opted into a veil of secrecy under the state civil service code concealing records about police misconduct that are public in more than 2,000 other Texas law enforcement agencies. Not a word on that topic in the story, but it's really the key accountability reform needed - if the public can't know what's going on at APD, the department can't be held accountable. Following up on this morning's post about Smith County's jail overcrowding crisis, I called Judge Cynthia Kent in Tyler to ask for more detail about her alternative proposal to building another jail. She graciously returned my call and forwarded a detailed press release explaining her plan to reduce jail overcrowding. Judge Kent pointed out that with the exception of Tyler's Mayor and the police chief, the-still-evolving plan largely represents a consensus among local judges and the criminal justice community, not just her own ideas. Some supporters are skeptical, she said, but given the county's limited options are willing to try it - even the District Attorney attended a Tuesday press confernece announcing the proposals. Because of Judge Kent's widely respected 21 years on the bench, she probably enjoys the gravitas needed to endure these slings and arrows. It's good she's taking the lead. On May 13, 2006, the voters of Smith County sent a loud and clear message that the two proposals for a new $75 million to $83 million dollar jail facility were unacceptable. This resounding defeat of the two suggested proposals placed on the ballot by a majority of the Commissioner’s Court have resulted in members of that same Court calling for a meeting to draft a new proposal to put on the November ballot for another jail facility. The real message of the May 13th bond election is that the Smith County Commissioners must develop a Master Plan and a multi-step plan focusing on a real downtown solution. The Commissioners should not rush to put yet another multimillion dollar jail proposal on the ballot. For the last two years, the majority of the Commissioners have looked at downtown only as an afterthought. The voters have clearly told the Commissioners that they want the jail to be located downtown. Therefore, the Commissioners should spend the time to really look at the needs of downtown. It is time to come up with an interim solution that will give the Commissioners the time needed to develop a real downtown solution. The local judges, district attorney, defense attorneys and Mr. Joel Baker today are offering the framework of a plan to try and safely deal with the jail overcrowding with an incarceration alternative program. This interim solution will enable the Commissioners to immediately start gathering information to begin the process needed for the 2007 Smith County Commissioners’ Court to review and develop a plan to take to the voters next year. This incarceration alternative plan will enable the Commissioners to take the time to address the shortcomings of the last two jail bond proposals; that is, to look at the County’s long term needs and to develop a downtown solution that meets all of the County’s needs. Conducting a careful dialogue with the members of the business community, public officials, courthouse and jail employees, concerned citizens in Smith County who can provide input as to the needs for a master plan for Smith County government facilities. This certainly can start with a hastily called meeting on May 31st but should definitely involve a number of working meetings over the next few months to carefully discuss and analyze the problems and all possible solutions to the facility problems of Smith County. Honestly listen to the needs of the county officeholders and employees. Assembling detailed information on how other counties in Texas and other states have dealt with jail overcrowding, courthouse and jail facility construction and design, and incarceration alternative programs. Assembling the above- referenced information for the 2007 Commissioners’ Court to develop a cost effective master plan for court facilities and a phased- in approach to providing Smith County with the appropriate locations and designs for our governmental and criminal justice needs. It should be obvious that Smith County will need a temporary program to help alleviate the overcrowding crise’s in Smith County so that the new Commissioners’ Court in January 2007 can develop their plan for facilities needs, dialogue with the citizens of Smith County regarding their plan. The current Commissioners’ Court should not try to rush another bond proposal on the November ballot and saddle the newly elected commissioners’ court with another bond proposal failure. The new Commissioners’ Court should only put a new bond proposal on the ballot after a comprehensive and honest disclosure to the public about the real needs and actual costs for making Smith County a safer community. The local judges, district attorney, and private attorneys are today proposing several ideas which could help ease the overcrowding crise’s, at least temporarily, and perhaps over a longer period of time, and still maintain the focus on public safety in the enforcement of our penal laws. 1. An Incarceration Alternative Program which includes a Community Supervision Day Reporting Center. Nonviolent offenders who have committed a drug offense or property crime would be referred to the Day Reporting Center for supervision and rehabilitation services. They will report each morning at a designated time and remain until late in the afternoon or evening. They would spend their evenings at home, instead of in jail, but must be at the Day Reporting Center each day. A. Drug/alcohol rehabilitation counseling through a licensed professional counselor hired by Smith County Commissioners to work full time in that Day Reporting Center. B. Receive job training and job counseling services onsite and be assigned for job interviews. D. Receive life skills training onsite. E. Be available and participate in job pool assignments and day labor jobs. F. Receive supervision in taking medication for mental illness under a program to be developed and manned by the Andrews Center (which will be asked to participate in a program to expedite the diagnosis and treatment of mentally ill nonviolent offenders). G. Participate in drug and alcohol screening tests. H. Submit to an electronic monitoring program and drug patch program while assigned to the Day Reporting Center. Smith County officials will develop working relationships with various employers in Smith County to encourage partnering with the Day Reporting Center as a resource for temporary workers as part of their community/industry involvement to help reduce jail overcrowding and encourage rehabilitation and reintegration of offenders into our community. This program could initially utilize space in the basement of the courthouse, in the old commissioners’ court facilities, or in vacant space in the newly remodeled Ferguson Building County Annex until the viability of the program can be evaluated for more permanent quarters. The Commissioners would have to fund the employment of additional probation officers, a secretary, a security officer, a drug counselor and other supply and equipment needs for the Day Reporting Center. Mr. Gerald Hayden is currently working with Judge Kent on proposals for the personnel and funding needs of such a program. Targeted defendants for this program initially would include persons in custody for refusing to pay their child support, theft by check cases, credit card and debit card abuse cases, thefts, forgery cases, other nonviolent offenses, and drug cases. It is possible that 200 currently incarcerated individuals may be eligible for consideration in this type of program. 2. The local judges, district attorney, and justices of the peace will be invited to a brainstorming meeting to discuss general issues involved with setting bail and the amounts which might be considered in nonviolent offenses, particularly misdemeanors and state jail felony cases. Judge Kent has offered to host this meeting on Thursday, June 1, 2006 at noon in the 114th Judicial District Court and have lunches brought in for the meeting. Reducing the amount of required bail, pending case disposition, could assist in maintaining a reduced jail census. 3. Develop a temporary program where a district judge and a county court at law judge will hold magistrate warnings for the misdemeanor and felony arrests the day and night before. This will help expedite setting bail, assess counsel needs, and move cases quickly toward dispositions. The District Attorney will assign one experienced prosecutor to be present at the next day dockets to help assess the case and discuss expedited case disposition with defendants or their counsel. If the defendant and prosecutor are in a position to dispose of the case, the case may be pled immediately in front of the magistrate judge who also exercises jurisdiction in that case. State jail felony cases can be pled on an information with a waiver of indictment and waiver of jury trial. Misdemeanors can be pled on an information. This type of expedited case disposition could result in quicker referral to rehabilitation programs for nonviolent offenders and maintain a lower incarceration rate for Smith County. 4. One district judge would host a drug court concept and handle, by assignment, all misdemeanors, state jail felony, and third degree felony drug charge cases. Defendants can elect to be referred to a drug court disposition by filing a written election within ten (10) days of their arrest. Upon magistration, the day after their arrest, they will be informed of the drug court program with an opt-in form provided to the defendant. If they do not opt into the program, their case will be assigned to one of the district or county courts at law on the normal rotation basis. Those defendants who opt into the drug court will plead guilty, receive a deferred probation sentence and be subject to the continuum of sanctions for violations and drug court conditions of probation. The judge will use creative incarceration alternative and rehabilitation programs for these defendants and personally monitor the progress of the defendant to recover and reintegration into society. There are a few of these drug courts around the nation. Although these programs are labor intensive and have mixed success, the programs seem to depend on the intensity of the efforts made to monitor, rehabilitate and educate these defendants. The use of the Day Reporting Center may be an instrumental element of the success of this type of sentencing philosophy. 5. Develop the Day Reporting Center or community service programs to be utilized for working off fines and fees in lieu of incarceration. This would be very important for municipal court and misdemeanor cases. While these programs would have to be subject to constant reevaluation by the district attorney, local attorneys, and the judges for effectiveness in maintaining a reduced jail population in Smith County while still having the primary focus of the criminal justice system in the protection of the public, they may help temporarily relieve the overcrowding cris’s. If the programs are successful, they may even provide long-term relief to the exploding jail and prison populations of Smith County offenders. A downtown jail site which connects with the current jail and current courthouse facilities. This must be designed to be expandable in the future for additional bed space. Develop a plan to upgrade our existing minimum security facility and possible expand this location. Design a new criminal courts facility or new justice center to connect with the expanded downtown jail. This must include a design for future expansion and must integrate security measures into that facility. Utilize the current Smith County Courthouse as is, with only minor security improvements, until the new court facility is funded and constructed. Develop a plan to further utilize the current Smith County Courthouse to house some courts or for expansion. Any remodeling of the Smith County Courthouse could accommodate four courtrooms and integrate appropriate security corridors into the old structure. Any rush by the Smith County Commissioner to spend five or six million dollars on the currently planned remodeling of the Smith County Courthouse is a waste of tax payer dollars, is another poorly designed plan which does not address the real needs of the community or the courts, and does little to make our citizens safe while appearing at the Smith County Courthouse. Instead of continuing to waste taxpayer dollars, the Smith County Commissioners should look to fund a Day Reporting Center and other Incarceration Alternative Programs and allow the 2007 Smith County Commissioners’ court to decide on what master plan should be presented to the voters for their careful and educated consideration. Judge Kent - who was sweet as Mom's apple pie on the phone, even if a little skeptical of my reasons for calling - appears to be providing important leadership in Smith County on this topic. I was utterly charmed, and impressed by her work. The first steps she's outlined would really make a big difference if the commissioners court approves them, improving public safety while reducing the burden on taxpayers. Materials from Judical Advisory Council Conference in January on strengthening probation. Tyler newspaper coverage of Judge Kent's plan. Among Texas jails, Tyler's (Smith County) is the most overcrowded in the state after Houston, but two weeks ago voters turned down bond proposals for two new jail facilities by margins of 63% and 86%. What happens now? Tyler district judge Cynthia Kent is shopping a plan to reduce incarceration pressures by releasing non-violent offenders and supervising them through a "Day Reporting Center" ("Judge reacts to 'naysayers'," Tyler Morning Telegraph, May 26). There, offenders would "receive drug and alcohol treatment, job training and day labor jobs," without the county paying to house them. The plan would cost $350,000 in the first year, compared with $3 million annually the county currently pays to house offenders in rented jailspace. "This is just a proposal and nothing is set in concrete at this time. If the commissioners approved this program, then it would be done on a case-by-case basis and not a blanket policy for these type of nonviolent offenders," she said. Judge Kent said the first people to be considered for the program would be those jailed for nonpayment of child support. "On April 17 there were 90 people in jail with their most serious offense being not paying their court-ordered child support. This plan is to reduce the jail population by 200 per day, and these people would be ideal candidates," she said. But the judge also stated that each case would be reviewed carefully with the public's safety in mind. She said those being approved for release would have to report daily to the Day Reporting Center and gain employment. Those needing counseling for alcohol of drug problems would get that help. The next group she said would be considered would be those in jail for fraud, theft by check, forgery and credit card abuse, "even repeat offenders." Swindle said he would not comment on Kent's letter, but said the business community of Tyler and Smith County has lost thousands of dollars to forgers, credit card abusers and those committing fraud and theft by check, and he did not want those people back on the street. Judge Kent responded that Swindle's statement was "painting with a broad brush," adding that not all offenders would repeat their crimes. Another worry for law enforcement officials and the mayor was whether the program's participants would follow the rules and report to the center faithfully. "Are some of these people not going to show up? Well, yes, there will be some that don't show up, but I believe most will and the community will benefit from the program," Judge Kent said. The judge said the program could save the county millions of dollars each year until the jail situation was remedied. "This is up to the commissioners to decide and it is a different program than we've ever had in Smith County. But if people are too scared and they listen to the naysayers, then we just won't do it," she said. Judge Kent invited the mayor and police chief to meet with her to discuss the program in detail so they could be better informed. Even if voters had passed the jail bonds, Smith County would need a short-term solution until new facilities were built. Kent's plan would relieve the burden on taxpayers and maximize public safety by changing nonviolent offenders' behavior instead of keeping them "off the streets." That's better for offenders, crime victims, and for the taxpayers, too. Judge Kent deserves a lot of credit for focusing on solutions when her critics offer only complaints. The first officer has pled guilty from the Troup Police Department in East Texas that was completely disbanded for drug corruption this spring. In the process, just a little more detail has come out during the prosecution of last year's Chamber of Commerce "Officer of the Year," Mark Turner. He apparently was seizing marijuana from suspects and using it himself or even sharing it with a confidential informant instead of logging it into evidence. He was convicted of tampering, a third degree felony, and also misdemeanor marijuna delivery. He will be sentenced in July. The police chief was arrested with Turner in March, but hasn't yet been indicted. Wanna bet prosecutors will pressure Turner to testify against the chief in exchange for favorable sentencing? That whole snitching thing works both ways. The scandal utterly closed down 5-man department. The Smith County Sheriff's Office now provides policing services for tiny Troup. Morally acceptable compared to what? Doc Berman and the Gallup poll bring news that more Americans find the death penalty morally acceptable than wearing fur, stem cell research or gambling - 71 percent think the death penalty is morally right. To me, it all depends on how you ask the question. Are there people in the world who need killing? Probably. Is the state of Texas competent to decide which people those are? No friggin way! The outcomes are too disparate: If nothing else, the poor go to death row while the rich are acquitted or even bump into the judge from their case shopping at the Galleria. The state's power should be limited - I don't mean any theoretical state, I mean this state, the state of Texas. The courts in charge of our criminal justice system at the highest levels often seem governed by buffoons. Our prosecutors seek convictions, not justice. Plenty of mistakes get made - too many to kill somebody on the government's say so. The Legislature should review and revise the state’s drug statutes so that, for possession of a small amount of drugs, the minimum sentence is low enough to provide sufficient discretion for the judge to choose an alternative to a long prison term. Some 21.7 percent of Texas prisoners, which amounts to approximately 32,550 inmates, are incarcerated for nonviolent drug offenses. Even for drug offenses where prison time may be appropriate, excessively high upper ceilings should be lowered. He also wants more drug courts, shorter probation terms, better treatment options, and a system of progressive sanctions for probation violators to reduce revocations. I wish I thought that was the message being delivered when Leininger's checks were handed out - I'm sure it's not. But it's amazing to me that the terms of debate among Texas conservatives have shifted to the point where the Texas Public Policy Foundation could call for long drug sentences should be reduced. Right now, possession of even the smallest quantity of powder is a felony offense in Texas - to reduce it at all would mean to reduce it to a misdemeanor. That would let those folks avoid employment, housing and other consequences of a felony record beyond incarceration that follow them around for life. Bravo, Marc! That took courage, saying what needs to be said. Sometimes the hardest things to say are the obvious - e.g., that the emperor wears no clothes. I hope you don't catch a lot of backlash for it. If the state's leaders followed your advice, I think they'd be grateful later. Then-House Corrections Committee Chairman Ray Allen, who recently retired, in 2003 proposed a prototype version of that idea in HB 2668, which would have reduced the lowest level drug offenses to a misdemeanor (see the introduced version). But back then the political process wouldn't allow it - the final bill kept the charge a felony but required treatment and probation instead of incarceration on the first offense. Levin's proposal expands upon Allen's original bill to include the idea of reducing drug sentences on the high end. I always thought it was gutsy for a Republican committee chairman to propose such a thing. This took guts, too. Give it a read (pdf). Plus, congrats to the Wandering Scribe on her book deal. She started blogging while homeless living in her car in the U.K., and has developed a big enough online following to attract a publisher. What a great blogging story. Why would an innocent person confess? In an extremely rare pro-defense ruling, the Texas Court of Criminal Appeals today overturned a murder conviction from Austin's infamous yogurt shop murders, declaring parts of a co-defendant's statements had been improperly read to jurors at trial without cross examination (See "Appeals court overturns yogurt shop conviction," Austin Statesman, May 24). Three judges dissented, saying the defendant's own videotaped confession was enough to convict. Though defendant Robert Springsteen claimed his confession was coerced, Judge Sharon Keller wrote that the defense offered no credible motive for why a defendant would falsely confess. Perhaps Judge Keller and the dissenting CCA judges should start reading Professor Alan Hirsch's blog, The Truth About False Confessions. There are a lot of reasons people falsely confess. UPDATE: Here is the opinion and the dissent. More from the Stand Down Project. In the same pdf file, find letters from Congressmen Sylvestre Reyes and Solomon Ortiz to the President and the Pentagon raising concerns about the President's authority to deploy troops in this way within US borders and the terms of engagement. Thanks to Will for the heads up. Every local newspaper should be tracking information about local excessive force complaints, IMO, because nobody else does it. A Corpus Christi Caller Times report ("Tracking the use of force," May 22) found that nearly 1/5 of "deaths in custody" statewide occurred prior to or during arrest. More than a fifth of deaths in custody occurred in Houston. Scott Henson, director of ACLU's Police Accountability project based in Austin, said to his knowledge, no organization in the state keeps track of excessive force complaints. "The big problem is we have a small amount of officers who are responsible for the majority of complaints. The other officers turn a blind eye and support the blue wall of silence that support that kind of behavior," Henson said. "Local newspapers do it. There's no one else. I don't have the staff to do it. We do an annual report on racial profiling data at traffic stops." That's at least been my experience - local newspapers and disgruntled family members of brutality victims are the only folks you ever see pursuing this critical information. I've been down that road, and even for an experienced researcher the lack of uniform reporting makes data a jumble. It's a shame the state doesn't do a better job of tracking such information. To the Drug Law Blog, which began posting in April. On days when you don't see blog posts on Grits, I'm usually working on some importunate writing task for work - at the moment, a major deadline in June. Today is one of those days. Hasta mañana. Former public defender and blogger David Feige will speak today at a lunch event hosted by the American Constitution Society in Austin. Here are the details - it's $15 bucks per head, $7.50 for students. CLE credit provided. Feige is promoting his new book, Indefensible: One Lawyer's Journey into the Inferno of American Justice. The Texas Senate Hispanic Caucus criticized implementation of Governor Rick Perry's "Operation Linebacker" program on the border last week, saying some sheriffs, especially in El Paso, are using the money in ways that overstep the legal authority of local law enforcement. El Senador didn't object to all uses of Operation Linebacker funds. "A good example of an appropriate use of opeation Linebacker funds is the plan developed by the Hidalgo County Sheriff's Department," he wrote. "Instead of targeting workers, the department used the funds to creat a specialized Criminal Illegal Immigration Unit that responds to violent criminal activity." I really think he's on the right track here.The Hidalgo County program sounds exactly like the kind of smart, targeted expenditure that could actually improve public safety and reduce criminality. Paying overtime for deputies to drive up and down the river in SUVs is a feel-good proposal that solves nothing. Hinojosa, himself a criminal defense attorney in Hidalgo County, said Sheriff Samaniego has no authority to conduct roadblocks or immigration raids. Though the Border Security Plan for Texas includes funds for local officers' overtime and hiring of additional local law enforcement personnel, it does not give the officers new arrest powers. Under Article 14.01 of the Texas Code of Criminal Procedure, a Texas peace officer may only make a warrantless arrest for a criminal offense if the criminal offense is committed in his or her presence or within his or her view.Texas law does not authorize a peace officer to engage in activities designed to uncover illegal immigration, such as immigration raids or roadblocks. the El Paso County Sheriff's remarks imply that Mexican ancestry or "looking Mexican" is sufficient to identify and detain undocumented immigrants. however,, in United States v. Brignoni-Ponce, the United States Supreme Court established a number of factors to consider before any federal immigration officer or employee may search or detain a person due to speculation over that person's immigration status. The Supreme Court ruled that Mexican ancestry alone was not enough to justify a search or detainment. Finally, Hinojosa noted that "Sheriff Samaniego's 'raid and roadbock' approach to immigrants undercuts the ability of law enforcement to ensure the public's safety because it discourages both legal and illegal immgrants from seeking help from the police. The sheriff's activities increase the likelihood that frightened residents will refuse to cooperate with law enforcement. El Senador closed by calling on Governor Perry to develop a "clear policy ... regarding the appropriate use of funds under Operation Linebacker." That would have been a good thing to do before handing out the money. Kudos to Hinojosa and the Senate Hispanic Caucus for holding the Governor and the sheriffs accountable for how this money is spent. Is Operation Linebacker making El Paso less safe? The enigmatic process that determines which Texas prison inmates should be set free on parole has long been prone to eruptions of scandal and corruption. Shrouded in secrecy and buffeted by politics, the system is largely ignored by the public until it boils over and brings down a governor or spawns criminal charges. The volcano appears to be rumbling again. A Dallas ex-con has been sent back to prison amid allegations that he bilked inmates and their families with false promises to help prisoners win parole. In recent weeks, state investigators have expanded their probe to include two other firms suspected of using the secretive nature of the parole process to cheat clients. As the investigations blossom, an Austin American-Statesman analysis shows that state parole officials appear to have little control over the network of attorneys — and hucksters — who ply the secret byways of the parole process trying to affect which murderers, rapists, drug dealers or embezzlers get out of jail early. "It's a mess," said William Habern, a veteran Huntsville parole attorney who has been complying with the law for 30 years. "If they enforced this law, there is no telling how many people they might find, how many lawyers are doing parole work and not registering, how many who aren't lawyers are doing parole work illegally and how many are charging exorbitant fees for little or nothing. The parole system is way too opaque and Ward's story shows there's hardly any way the public can look inside the black box to see how it really works. Reforms that enhanced transparency and made the process easier and less uneven in its application seem like the right first steps - maybe even a public defender office to represent indigent parolees and a lot more public documentation about how decisions are made. Gary Cohen, a longtime Austin parole attorney, agrees. Cohen, who discloses fees on affidavits and last year provided no fee detail on his annual report, says the fee disclosure rule is "outdated and redundant" and does little to enlighten the public. "If the original intent of this law was to keep paroles from being sold . . . it serves no useful purpose now," said Cohen, echoing sentiments of other lawyers. "No place in state law are attorneys required to disclose specific fees like this, and even if you know what someone charges, you still can't make any judgment about whether qualified or reasonable services were provided. . . . In light of recent events, that should be the goal." The Texas Criminal Justice Coalition has posted an online survey to gather opinions regarding The Texas Department of Criminal Justice (which is up for "sunset review" this year) and various proposed reforms. Take the survey. They're compiling responses and suggestions to contribute to the once-every-12-year sunset process. RELATED: Here's TDCJ's 158-page self-evaluation (pdf) prepared for the Sunset panel. I'm saddened and a little surprised by President Bush's ill-considered decision to place National Guard troops on the border. I seems SO cynical: As a security measure it's an excellent political gesture, but there's no pragmatic justification for the plan. Twice as many troops wouldn't be enough to halt immigration, and the nation can't afford to militarize the border indefinitely - after all, the Pentagon still needs soldiers to occupy Iraq. (My guess: troops on the border re-deploy right after the November elections.) Congress is already diverting money from Iraq to the southern border, now I guess we'll be diverting troops, too. The scheme brings with it a truckload of practical problems: Soldiers aren't trained for the delicate task of parsing immigration status in the field or conducting searches under auspices of the Fourth Amendment. Not to mention we've tried this before, though it seems like the Texans around Bush have awfully short memories. While Bush was Texas Governor, the U.S. deployed military troops to the Texas-Mexico border to fight the War on Drugs and the adventure ended disastrously. Don't believe me? 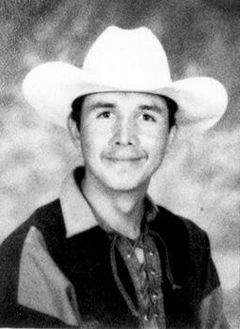 Ask the family of Esequiel Hernandez, the teenage shepherd pictured above who was killed by a marine in 1997 near Redford on the Texas-Mexico border. If it's true that history repeats itself - the first time as tragedy, the second time as farce - then we can look forward to an ugly, chaotic summer. Many of these troops are returning from Iraq and Afghanistan and probably hoped they'd go home to see their families. Instead they'll spend the next few months soaking in the 100+ degree desert sun laden with miltiary gear. That should give a huge boost to troop morale, don't you think? Will the National Guard employ the same rules of engagement on the border as troops were trained to abide by in Iraq and Afghanistan? If not, will they be re-trained? You've got to feel sorry for the Guard troops caught in the middle. Trained to fight in a real war, they're being deployed instead on a pointless highly, politicized exercise that's doomed to fail before it begins. Troops apparently won't be patrolling or making arrests but will play a "support" role. I don't know what that would even mean - that it's mostly for show, I guess. A big waste of time and money that achieves no public policy goal but symbolically placates the President's base. The Senate, too, appears to be adopting a more xenophobic stance in light of the President's address - even including the ridiculous idea of building a wall. Note to the US government engineering geniuses who must design this boondoggle: The border between Texas and Mexico is a river basin! Land will quickly erode underneath any wall you build after the first gullywasher. After a couple of years, nature would open up gaps with little human assistance. You could build with chain link, but folks would quickly and frequently cut it. Iron bars would be expensive, could be hacksawed, and would be hard to repair. Plus if contractors can't hire illegal immigrant labor, I doubt they can find enough workers to build or maintain it anyway! The whole idea's just dumber than dumb - an empty political gesture disguised as a public policy decision. This is why I hope Texas NEVER switches to annual legislative sessions. Nothing good seems to happen when politicians make public policy in even numbered election years. Parks is one of those playwrights, and they are truly few, whose works I enjoy reading even more than seeing them staged. It's not that her plays aren't great vehicles for dramatic stagecraft. (They don't hand those Pulitzer Prizes for drama out to just anybody.) She's just such a brilliant writer, I always enjoy lingering over the layered metaphors and lyrically loaded language for longer than the theater setting allows. I can't wait to read her new novel. Whenever I've seen one of her plays, I go home eager to lay my hands on the text and more or less devour it afterward. Anyway, while answering questions after her talk, Parks made a comment that cut to the core of some of my own struggles as a writer, especially focused as I am on nonfiction (all my own efforts at fiction writing were both private and mediocre). One must distinguish between "facts," "history" and "truth," she declared, and the former two frequently obscure instead of illuminate the latter. When they conflict, she said, she felt obligated as an artist and a person to cling to truth. That's a difficult hurdle for me - a lot easier said than done. I spend a lot of time searching through "facts" and "history" looking for "truth," and am often troubled that "truth," in the end, does seem to be something separate and apart from facts and history, from the issues of interest, analysis, and argument that so frequently consume this blog. As ancient Taoist philosopher Chuang Tzu wrote (trans. by Thomas Cleary), "Suppose I have a debate with you, and you beat me, I don't beat you - does that mean you are actually right and I am actually wrong? If I beat you and you don't beat me, does that mean I am actually right and you are actually wrong? Are both right? Are both wrong?" Maybe fiction writers face a less onerous task on that score. Maybe it's easier to seek truth when facts and history don't so aggressively obstruct one's view. UPDATE: For other accounts of last night's event see the Austinist, Spark blog, and local playwright Adrienne Dawes. Tyler voters: Jail bonds a "no-no"
Here's something you don't see every day: Voters rejecting new jail construction in my hometown in East Texas ("Both Smith County jail bonds fail," Tyler Morning Telegraph, May 13). Voters thought two jail-building proposals on the ballot totaling $158 million were too grandiose and expensive, plus a new satellite site was opposed by neighbors based, apparently, on largely NIMBY grounds. This vote indicates to me that conservative voters in Deep East Texas can be convinced to prioritize their anti-tax agenda even when it affects sacred cows like criminal justice. With luck, the referendum could open the door for more effective, less expensive reforms. The jail in Tyler faces what appears to a be more severe overincarceration problem than any Texas county except Harris. As of April 1, the jail was full with 722 inmates (pdf, 55% were awaiting trial) while Smith rented 267 jail beds in other counties, more than any other according to a monthly state report (pdf). I promise voters in the Rose City weren't acting on some liberal, anti-incarceration impulse by any stretch. I doubt you could find two liberals to rub together in that town if you searched all day. Instead, it's virulent anti-tax, nearly anti-government conservatives who dominate local politics - the kind of people who, like Grover Norquist, long for government so small you could drown it in a bathtub. Among the most ideologically pure, that small-government belief system runs head on into Texas' current criminal justice policies, which have given us full local jails, full state prisons, a new boom in taxpayer-financed public and private detention facilities, and a ubiquitous slew of local jail building proposals. A brochure promotoing the jail bonds (pdf) put out by Smith County estimated that the number of jailed inmates would increase by 2025 to more than 2,100, requiring a nearly 200% increase in total beds to house them. It's easy for a small-government conservative to look at that proposal and rightly wonder, "Where does it end?" The expansion curve for incarceration in the jail is so steep right now - i.e., the rate at which people are being incarcerated is increasing so rapidly - that bonds for this jail expansion wouldn't be paid off before more jail building was required! To a fiscal conservative, that makes no sense. The Tyler Telegraph filed an open records request (pdf) and discovered that many in the jail committed low-level drug offenses ("Drug offenses top problem in Smith County Jail," May 9). On the average day, says Tyler attorney Randy Gilbert, "we have as many people in jail sitting out sentences for non-violent misdemeanors as we have prisoners farmed out to other counties ... Can we look at ways to reduce that?" According to the sheriff, "some people arrested on misdemeanors simply decide they cannot afford to bond out of jail so they remain jailed for the offense," reported the local paper. Smith County should create a pre-trial screening system to identify more low-level offenders who should be eligible to receive personal bonds, and judges should start granting them. Smith County judges should establish a system of "progressive sanctions" to better supervise probationers and reduce revocations, especially for misdemeanants who must serve time in the county jail if revoked. State money is even available to support this idea. Related: Judges should use "early release" provisions in state probation law to provide incentives for good behavior by probationers and to reduce both caseloads and revocations. Tyler's growing at an amazing rate right now and maybe they'll need a new jail before long. Even better, though, would be to rethink criminal justice priorities in a way that maximizes public safety at a minimal cost. I'm glad some local heavyweights like Judge Kent put the kabosh on the "Build it and they will come" model the Sheriff and commissioners court settled on. They need a coherent plan for managing jail populations, not a knee-jerk reaction. For more see Grits' best practices to reduce county jail overcrowding, and Smith County's web resources on the jail proposals. Maybe I just don't accept good news well, but I'm not sure how I feel about this Zogby poll. On the one hand, I'm comforted by the fact that Zogby found Americans are abandoning a "punishment only" approach to crime to focus more on redemption, rehabilitation and funding for re-entry programs. On the other hand, I've started to notice that statistics overstating the dangers of crime are routinely touted even by those sympathetic to reform. In this case, pollsters told respondents 60% of felons leaving prison are likely to return there, while in Texas, for example, the three-year recidivism rate is just 28.3%. Three out of four Americans expressed either fear or concern about the 700,000 prisoners who are leaving U.S. prisons each year, and the fact that 60% of them are likely to commit crimes that send them back to prison, Zogby International’s national survey showed. The poll explored what people think ought to be done about the situation. The survey, sponsored by the National Council on Crime and Delinquency, a leading criminal justice research organization, reveals that by almost an 9 to 1 margin (87% to 11%), the U.S. voting public is in favor of rehabilitative services for prisoners as opposed to a punishment only system. Of those polled, 70% favored these services both during incarceration and after release from prison. Likely voters appear to recognize that our current correctional system does not help the problem of crime, the survey indicates. By strong majorities, Americans said they feel that a lack of life skills, the experience of being in prison, and the many obstacles faced upon reentry are major factors in the crimes that prisoners commit following their release. By an overwhelming majority (82%), people feel that the lack of job training and job opportunities were significant barriers to those released prisoners who wanted to avoid committing subsequent crimes. Similar large majorities saw the lack of housing, medical and mental health services, drug treatment, family support and mentoring as additional barriers and thought that all of these services should be available to returning prisoners. Most of the respondents felt that these reentry services needed to be introduced to prisoners long before they are released. The public appears far ahead of the politicians on this one, except maybe Karl Rove and President Bush (who notably touted re-entry programs for prisoners in a State of the Union address). Neither party, though, has been able to capitalize on political support for these reforms. Too many Democrats fear being labeled soft on crime, while not enough Republicans picked up the President's mantle after that SoU address to really have an impact. This poll shows there's political hay to made being smart instead of "tuff" on crime if politicians can muster the courage to take up the cause. The public can plainly see what we're doing now isn't working. Today (Saturday) is election day for Austin's municipal races. Here's a list of polling places. I wanted to briefly offer my own endorsements, making clear they represent only Scott Henson's picks, not any of the groups with whom I work. More important for the future of the city than any of the candidates are a raft of charter amendments, including Proposition One which I've defended at length on this blog and at Open Government Austin. Bottom line: I'm supporting all of them. On Prop One, the Open Government Online amendment, if nothing else think how fun it will be for local bloggers when most city government information is online, including city councilmembers appointments and phone logs. I'm telling you, that will fundamentally change the culture in which city government operates, and for the better. In addition, the amendment would open key records about police misconduct that are available at most other police agencies but not the Austin PD. But the other amendments are important, too. I support raising the campaign contribution limits (hell, I support getting rid of them). I don't like term limits so extending them is okay by me. I want to restrict development and roadbuilding in the Barton Springs watershed. I think it's fine to allow health benefits for unmarried partners of city employees regardless of sexual orientation. All that's good stuff. There's not one proposal that does anything bad. To me, Prop One, though - the Open Government Online charter amendment - is the most important for the general public by far. It truly has the potential to permanently democratize politics in ways no one now can imagine. As for the council races, I've learned in local politics it's unproductive to choose the lesser of evils, so I can't advise voting for any of them and don't think it matters THAT much who gets it. (In a dream world, I'd like to see underfunded longshot Kedron Touvell, who was great on the issues, take out the arrogant bully Brewster McCracken.) But elections don't change a bad process, and history shows what really matters is holding council's feet to the fire once they're in there (which is why we need the new public tools in Prop One). In the Mayor's race, though, Danny Thomas clearly is a better choice than incumbent Will Wynn. I've disagreed plenty with Thomas, a former Austin police officer and current Place 6 city councilman, but you can appeal to him based on what's right and wrong, while the Mayor can't be appealed to on any level but raw, tiresome power games. I fear Thomas can't overcome the money disadvantage, but I'm voting for him. UPDATE: We lost. It was ahead of it's time, I suppose (or perhaps just the victim of scurrilous lies by the opposition) but the open government online amendment failed at the ballot box. I mean, how often in a campaign does a judge say negative campaign attacks are "misleading"? In the end it didn't matter. Surprisingly, with strict message discipline, outright fabrications work well as a campaign tactic in the short run, expecially if, as in this case, the folks who buy ink by the barrel are on their side. That's the other weird element of this election: This campaign forced the local Austin print media, the Austin American Statesman and the Austin Chronicle, to choose sides: Are they insiders and power brokers, in which case they benefit from secrecy? Or are they journalists who benefit from public information? News flash: They're insiders. They'd rather be gatekeepers for the news than let everybody see information themselves online. After all, then why would we read them? Report to La Migra as probation condition?